As 1985 drew to a close, so did Starfox' time with the team. But before the ever flaundering Eternal went a'wandering, there were some loose ends to tie up and as it turns out, those would be the ties that bind. 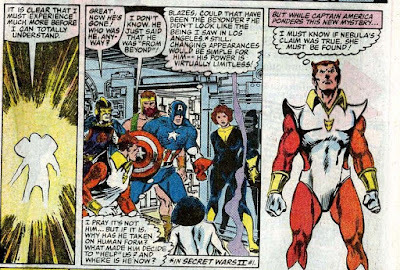 But before Avengers writer Roger Stern gave Starfox the boot, there was still the ongoing subplot of the power mad Vision to deal with. 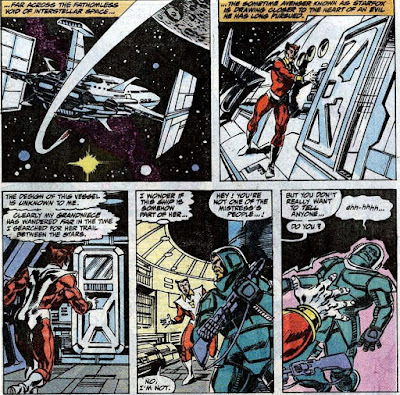 Back in December, 1983's Avengers I#238 it was Starfox who had set up a mind link between the android and the sentient world computer I.S.A.A.C. Starfox meant no harm, but by arranging this meeting of the A.I. 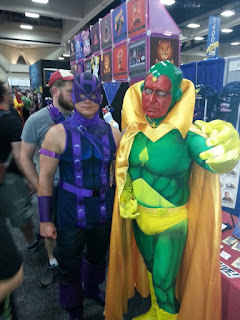 minds, he'd put the idea in Vision's head to take over all of Earth's computers and run the planet like I.S.A.A.C. did Titan. That explained his odd behavior, like forcibly ousting Wasp as Avengers chairman and setting up a secondary team on the West Coast to expand his power base. 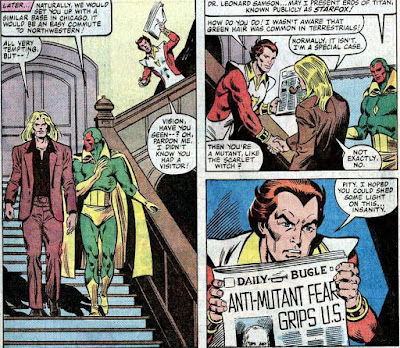 He even invited gamma powered psychiatrist Leonard Samson to the mansion because he wanted him to head up a third Avengers team in the midwest. 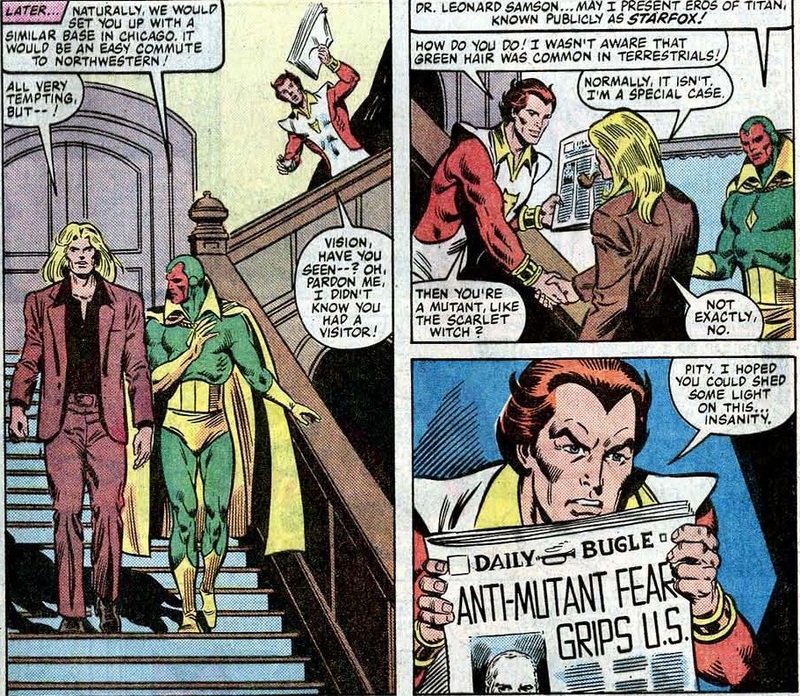 Samson turned down the offer, but his visit did give him a chance to interact with Starfox who was still none the wiser about Vision or Earthers in general, as shown in Avengers I#253.
" How do you do! I wasn't aware that green hair was common in terrestrials!" Sigh... Of all the inconveniently awkward coloring gaffs. But Starfox was too busy to notice Samson's hair was blond. He was far more concerned his teammates had been treating him differently ever since they learned of his emotion manipulating powers. 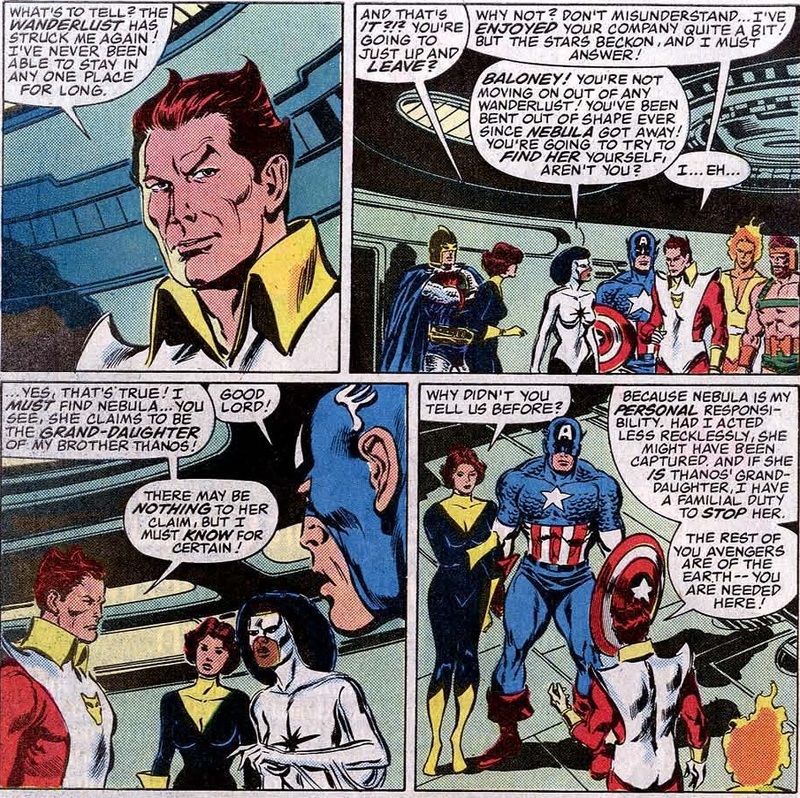 Which is tad hypocritical, after all he didn't bring it up during his membership application back in Avengers I#232. And later, when he sensed that the team took a dim view of hidden abilities, he kept his mouth shut again. 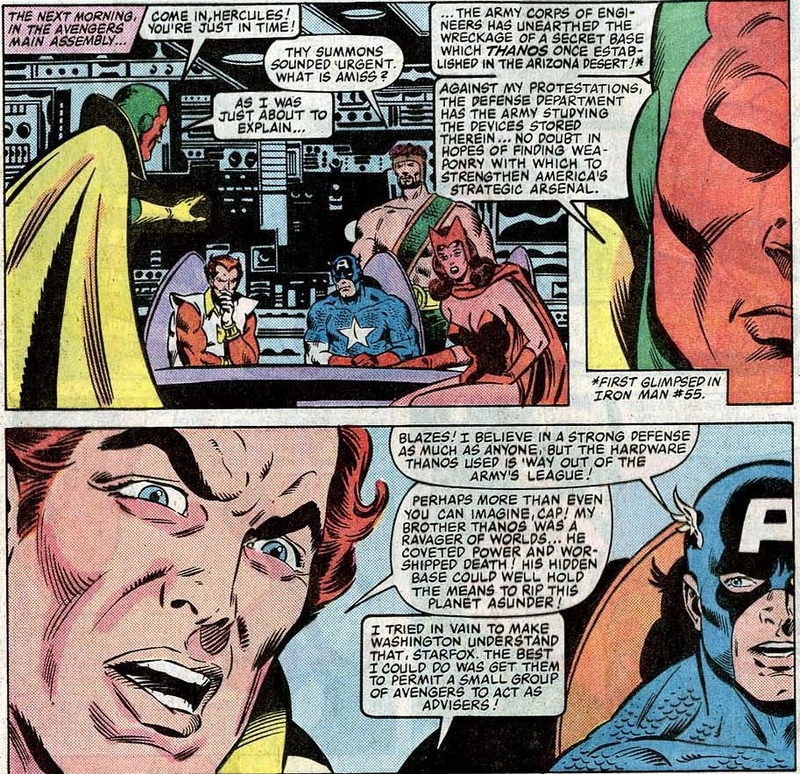 But in Avengers I#252, he decided to confront his teammates over dinner.
" These mortals! They grow so solemn at the slightest provocation!" Solemn or not, this be storytelling at its best... Roger Stern used Starfox's concerns to further the Vision storyline while also giving Hercules some much needed character development. Even though he'd been a member since 1967, Herc never received much in the way of proper character arcs or even particularly deep thought. Whenever he showed up, the prince of power was mostly played for comic relief, think Volstagg if he was Greek and worked out more. But Stern intended to make Hercules a mainstay while slowly making Starfox superfluous. 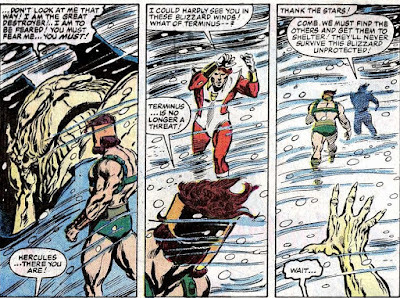 By then, the Eternal served as the team's resident powerhouse but Hercules was mighty too. 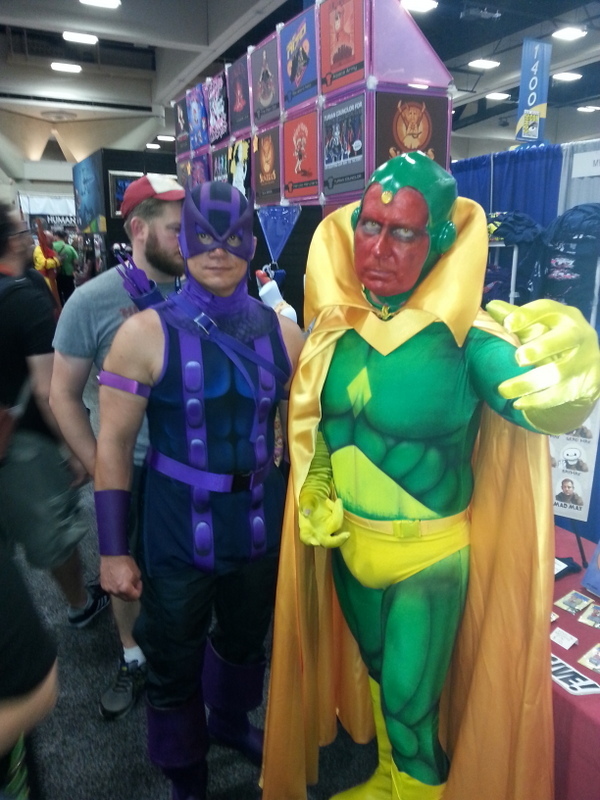 Getting back to the Vision's dreams of planetary rule, he was about to start his scheme after months of planning. The plan was shockingly simple: he decided to rule by taking over the world's computers. Back in 1985, that still seemed a somewhat manageable task. 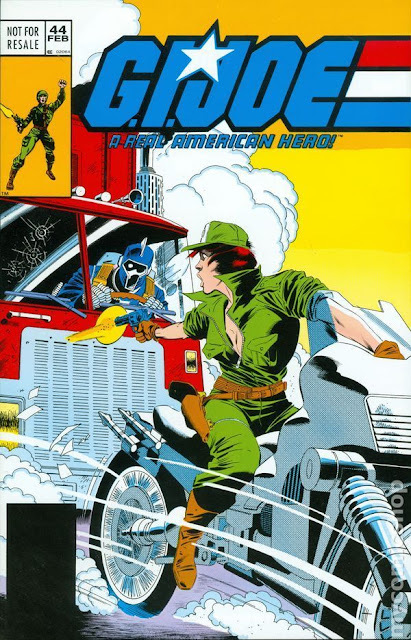 He already had access to the NATO and US defense systems thanks to the Avengers' security clearances. Once he was in, I.S.A.A.C. would help him spread his influence on a global level until he would literally be the ghost in the machine. However, to carry out his plan he needed the others away from the mansion. Using his position as chairman, he sent them on several bogus missions. 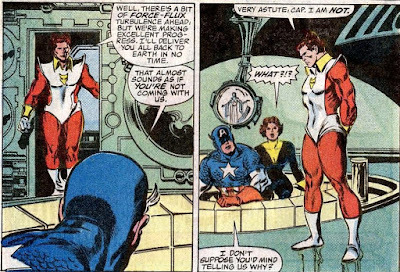 For one, he ordered Captain Marvel to check out Thanos' old command post Sanctuary II in deep space claiming he'd detected some "disturbing readings". And as for the others... Thanos had a base or two on Earth too.
" My brother Thanos was a ravager of worlds. He coveted power and worshipped death! His hidden base could well hold the means to rip this planet asunder!" So with Earth's mightiest off on a wild goose chase, Vision and I.S.A.A.C. launched their grab for world power. They were briefly interrupted by the Black Knigh who had unwittingly dropped by for a visit only to be quickly trapped by Vision using the mansion's security systems. 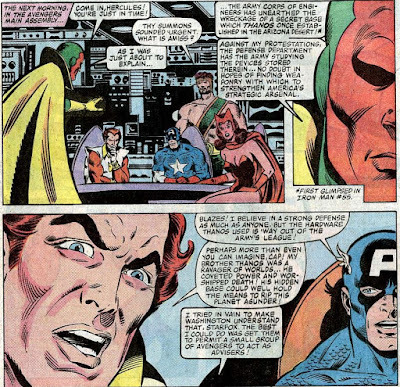 Only after the Avengers and the West Coast Avengers realized the Vision was unhinged, the truth came out. Both teams invaded the mansion through its heretofore unseen submarine pen. Once inside, the individual members had confrontations with aspects of the Vision. Eros seemed most efficient at conveying the truth. "I.S.A.A.C couldn't run Earth and neither can you!" " The control crystal... I'm done with it... Forever!" Android or not, yanking out a good chunk of your brain really shouldn't be that easy. 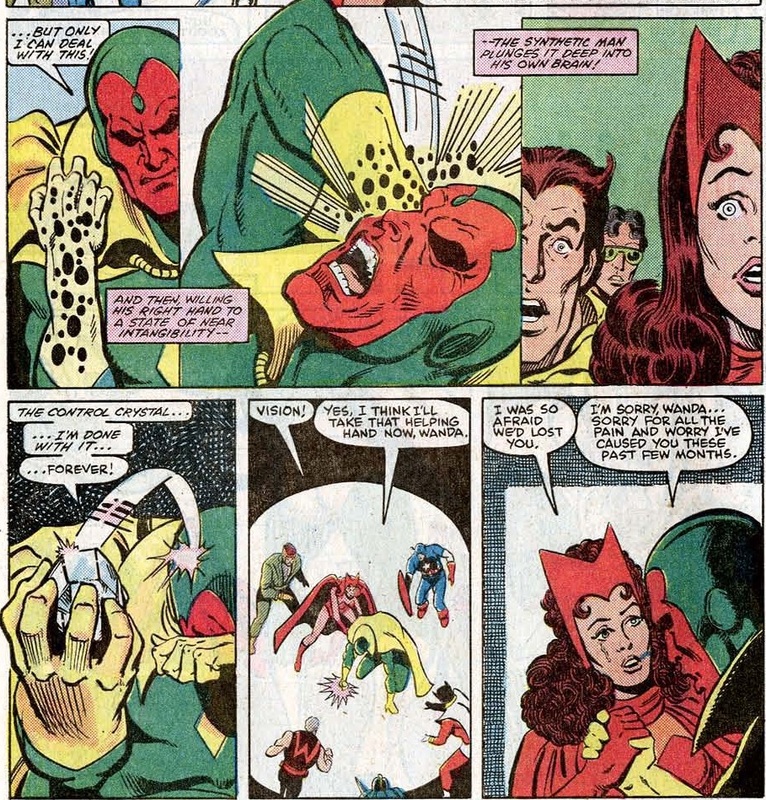 But Vision wasn't out of the woods yet. Even though the existence of the control crystal could have given him an easy out, Stern decided to have him face the music. Vision stepped down and turned himself in.But the US government wanted more. For instance, the equipment he had constructed with help from I.S.A.A.C. 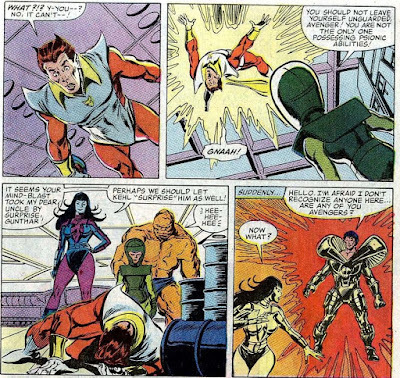 But Starfox took care of that, as we saw in Avengers I#258. "You've put yourself through all this for nothing, sir. 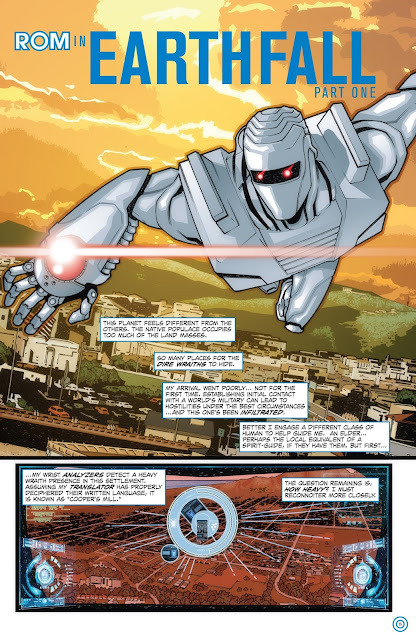 I personally disassembled the Vision's equipment days ago." Government liaison Raymond Sikorsky is not wrong... Disassembling the Vision's technology is a fancy way of saying you destroyed a piece of evidence. But it's not like Starfox can be brought up for charges, he isn't even native to this planet after all. But that's the Vision dealt with as far as Eros' involvement was concerned. 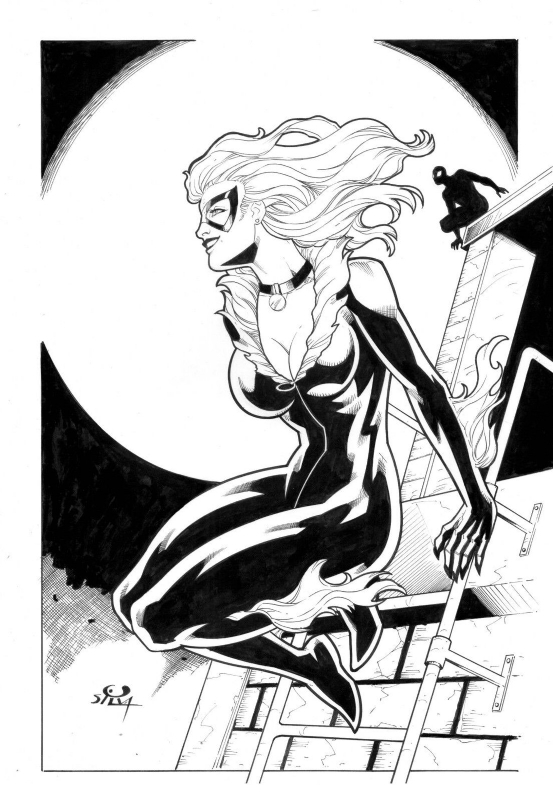 You'll note that the art style changed dramatically in between panels. Yes, the late great John Buscema had arrived to take over for Al Milgrom which meant the book had a distinctly different feel to it. 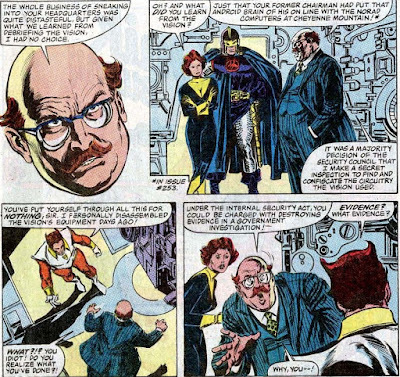 Aware of Buscema's love of sword and sorcery characters, Stern had the Black Knight stick around as a member. This provided the team with a new resident scientist, the part Eros had been playing as well. He was slowly but surely made obsolete. But Roger Stern made sure to take care of any danglers, like Wasp being afraid of Starfox after she learned what he could do. "It's disturbing to discover that someone you thought you knew can control people's minds!" Leave it to the wealthy socialte heiress to be right on the money... 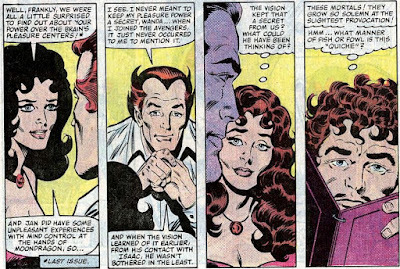 It is creepy, especially after all the trouble they'd been through when Moondragon was around and tried to run the team with her mental powers. Having the ability to influence and control those around you and not even being candid about that only makes you more insidious and untrustworthy. So, let's see how Starfox explained himself.
" Jan, I use my special powers only on enemies. Never on friends... Unless they want me to!" But this is as apologetic as Eros got. Guess we should take his word for it, after all he acted noble and heroic since he first joined and that's gotta count for something. 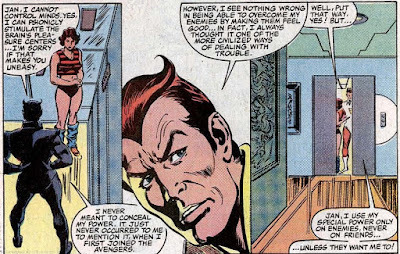 It's very comparable to how the X-Men had no other choice but to trust professor Xavier when he said he wouldn't violate their thoughts. Time to get some avenging done... In what would be his last Earth mission as an active member, Eros joined the others in the Savage Land where Terminus had recently resurfaced. He tried to take the giant alien pillager on, but got swatted away like a fly. But even in failure, he still got the girl.
" I'd probably have fallen on my keister if it weren't for Starfox!" ... In Savage Land, you don't hold girl, girl holds you. What a country! 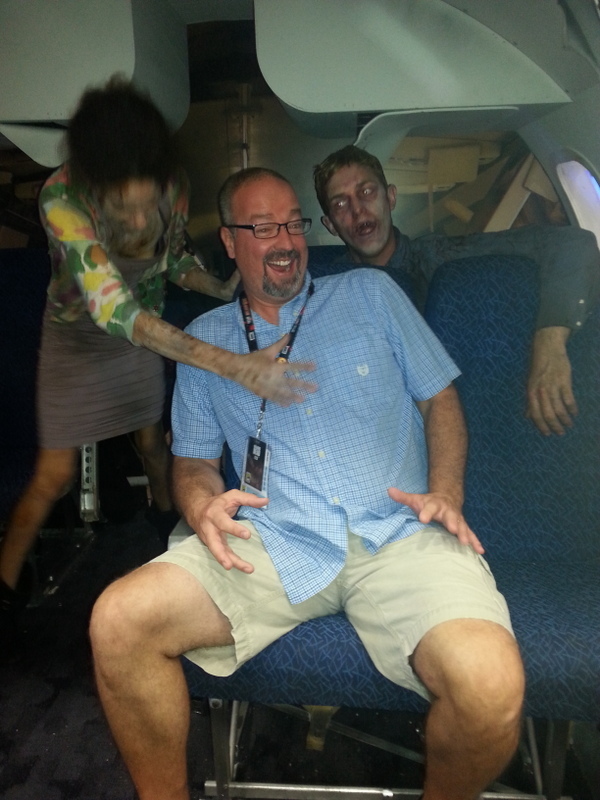 All kidding aside, Terminus proved to be a major threat. After reaching Pangea, he ripped apart its environmental control systems which led to the deaths of thousands when the artificial jungle climate fell prey to the arctic frosts. That led the Wasp to make a shocking decision when she ordered Hercules and Starfox to "stop" Terminus. "Give him one for me!" 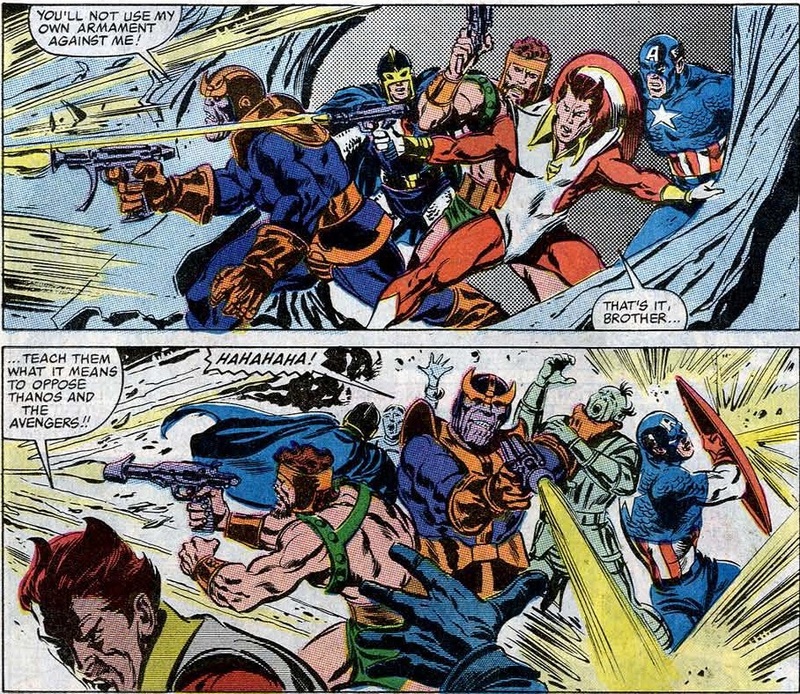 Avengers don't kill, especially not during the 1980s. But what other way to "stop" him is there, after the countless deaths he's caused? Hercules manages to rip his armor open, revealing that Terminus wasn't actually a giant at all, merely a morbidly obese human sized alien who operated the armor like a big robot. "Terminus... is no longer a threat!" Leaving an helpless alien to die in the cold. That's... cold. Later stories would retcon this, saying this was actually a Deviant called Jorro roped by the real Terminus to be his accomplice. Nevertheless, that doesn't change the fact the Avengers allowed an enemy to die. At the very least, that makes them accessories to murder. Now, time to wrap things up and get Starfox off Earth. Remember how Vision had sent Captain Marvel to check on Sanctuary II? She never came back. Turns out there was actually something going on, the massive vessel was being commandeered by Nebula and her space pirates who trapped Monica and forced her to join them as they unleashed a reign of terror all across the cosmos. Xandar was among the first to fall as Nebula moved her attention to the Skrull empire that had fallen into civil war following the destruction of their throneworld at the hands of Galactus. The Avengers learned of this from Galactus' former herald and Xandarian Firelord. Worried about their teammate, they decided to go after Sanctuary II.
" The swiftest starship produced by the science of my homeworld of Titan... 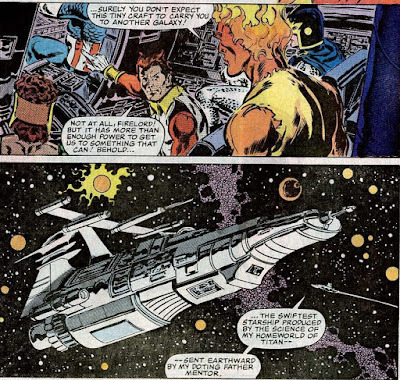 Sent earthward by my doting father Mentor"
Man, John Buscema could draw the heck out of a spaceship. And Stern sure could write exposition to match... 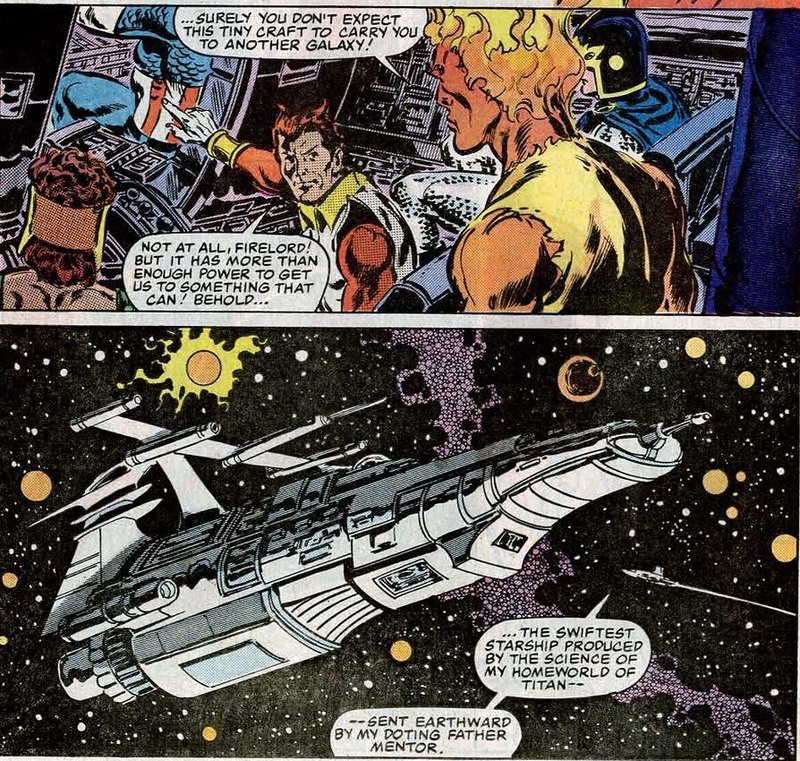 Using the Titanian vessel, the Avengers learned much of what was going on in space and teamed up with Skrull general Zedrao and his forces to take on Sanctuary II. 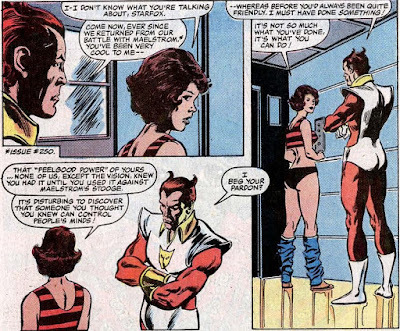 For those of you keeping score, Zedrao was also the one who visited Captain Mar-vell on his deathbed to honor him for his valor. That led the team to trust him even as they engaged in an engaging bit of subterfuge. "That's it, brother... Teach them what it means to oppose Thanos and the Avengers!" 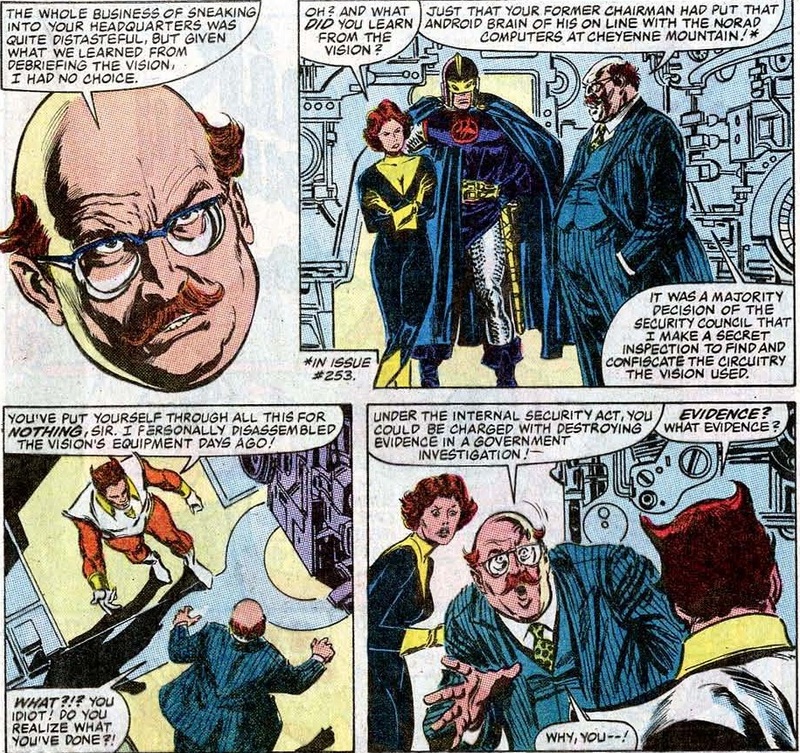 "Thanos" was actually Zedrao, cleverly playing into the fear among many of the Titan's former henchmen that the purple potentate would one day return from the dead. And they weren't wrong to be afraid, six years down the line Thanos would be alive and well for Jim Starlin's Infinity Gauntlet. But for now, he was still quite dead and Starfox was ready to stake a claim to Sanctuary II. 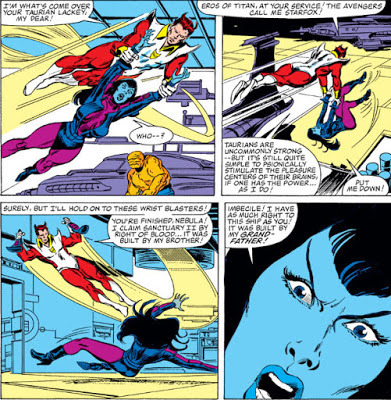 But when he finally came face to face with Nebula, the usurper had a surprise. "Imbecile! I have as much right to this ship as you! it was built by my grandfather!" ... Did not see that coming. "Hello. 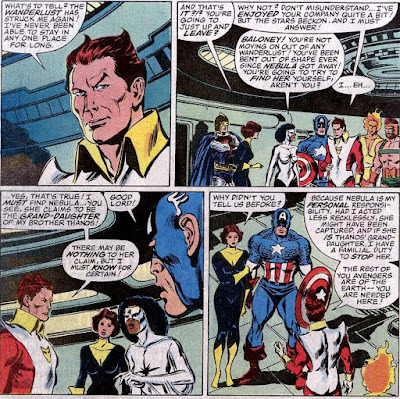 I'm afraid I don't recognize anyone here... Are any of you Avengers?" 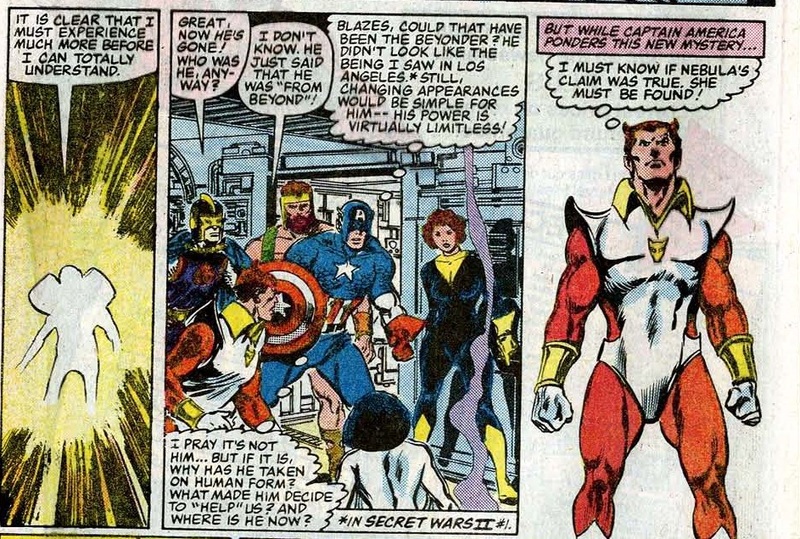 Ye gods, if it's 1985, it's time for Secret Wars II and that means a mandatory visit from the Beyonder. 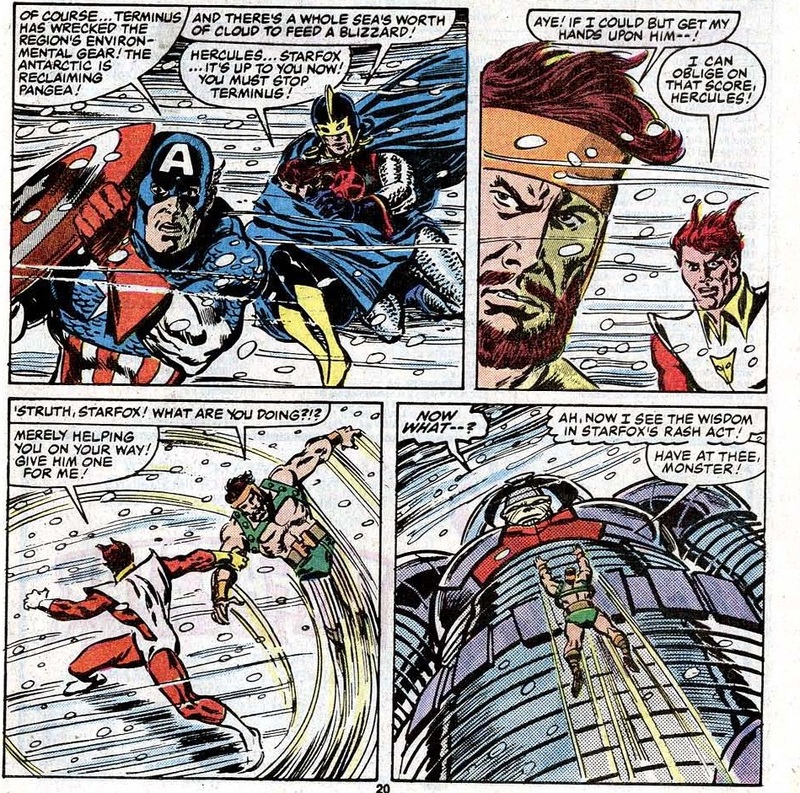 The cluelessly naive almighty one actually helps Nebula escape, which leads Starfox to make a decision. "I must know if Nebula's claim was true. She must be found!" ... Erm, why? I mean, sure she's certainly not harmless but I wouldn't call her an immediate threat. You recovered Sanctuary II and caused it to self destruct, so with her main base of power gone Nebula is little more than a terrorist who claims to be related to you. 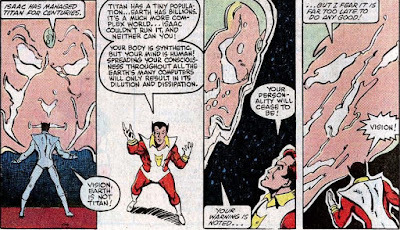 If family was that important to the Titan Eternals, wouldn't they have bonded together before to stop Thanos? 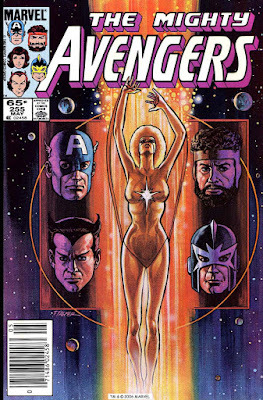 Still, it was clear Roger Stern wanted to move the Avengers in another direction and Starfox needed to go. Having him off in space chasing his alleged grand-niece was a perfectly serviceable way of dumping him. 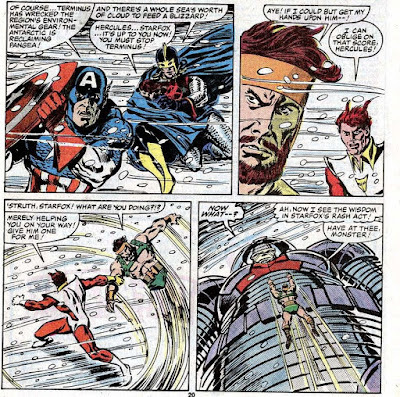 So, after a crossover between the Avengers and Fantastic Four annuals of that year that saw the Skrull race losing its ability to shift their shape, Starfox had an announcement to make in December 1985's Avengers I#261. 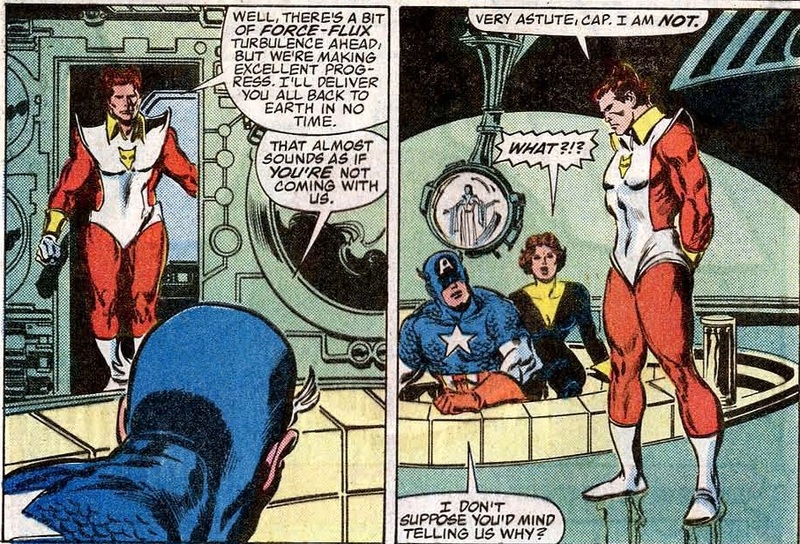 "That almost sounds as if you're not coming with us"
"Because Nebula is my personal responsibility. If she is Thanos' granddaughter I have a familial duty to stop her." And with that, he was off, along with Firelord who was eager to make Nebula pay for destroying Xandar. Was it really such a loss? At the time, readers didn't dislike Starfox, but they didn't particularly loved him either. He was just... there. And that's just not good enough, especially after the initial mystery and wonder about him wore off. After Stern resolved the long running issue with his secret mind control powers, he became a pretty regular member. Great guy to have around, but kind of bland especially when he lost his overly lascivious streak. There wasn't any real conflict or drama, how can you hate a guy who just wanted to have fun? For the 2.5 years he was with them, Starfox served a meaningful purpose. He shook things up when he arrived, provided a special flavor missing from the team especially after the sassy She-Hulk left and proved to be both powerhouse and residential genius. But the incoming members Hercules and Black Knight would provide Stern with more ample story opportunities. 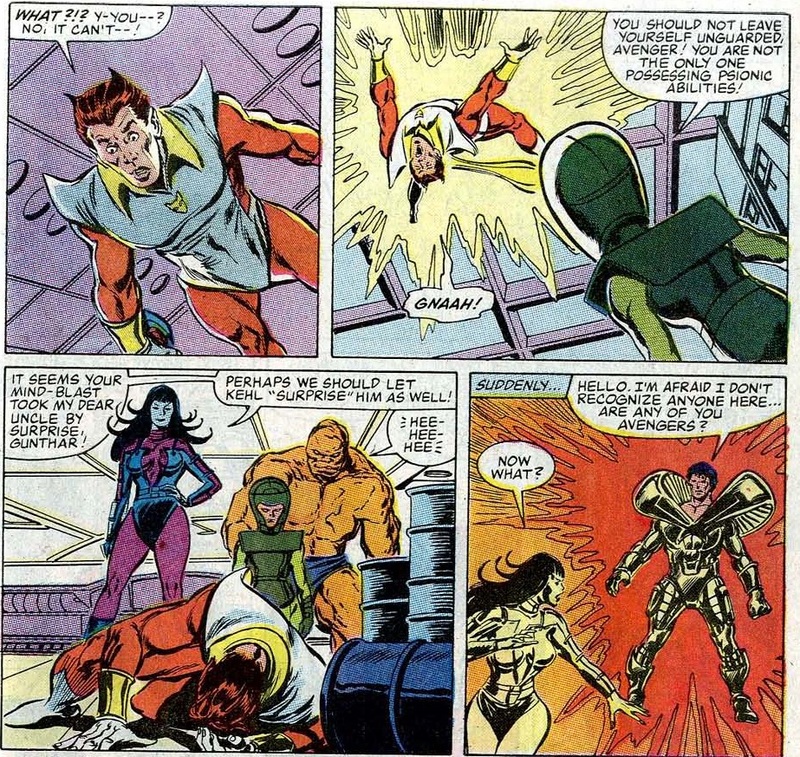 Hercules chafed under having to follow a mortal woman in combat, while Starfox had no problem with Janet calling the shots. 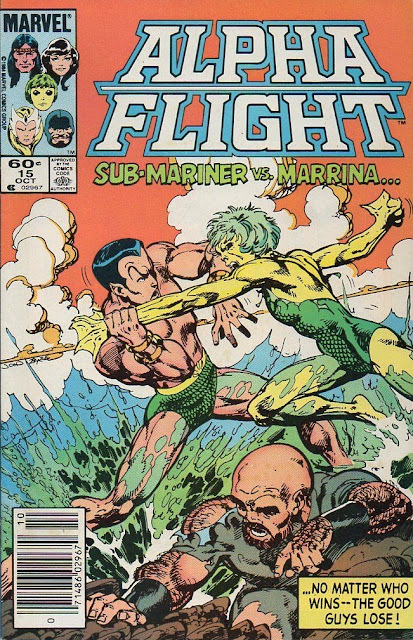 If Starfox had still been around when Namor joined a few issues down the line, he'd be even more expendable. What team needs two barrel chested, womanizing strongmen who can fly? And what of the Mansion Siege? 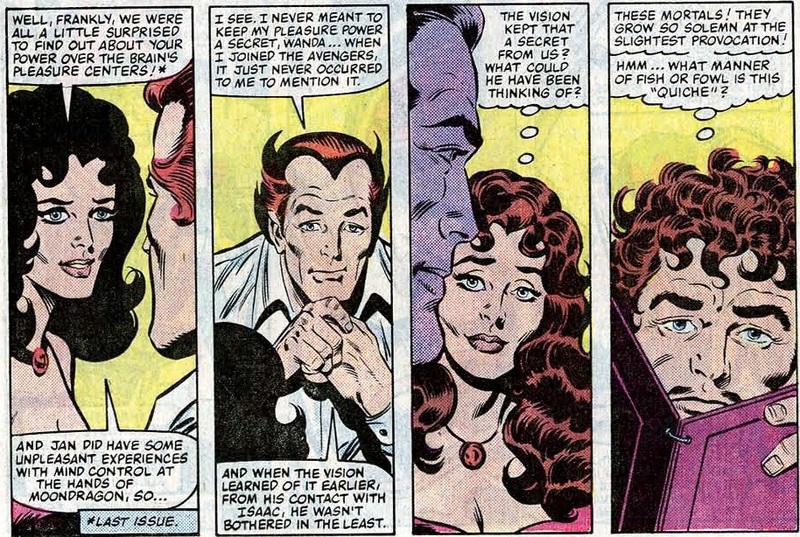 Eros could have dealt with all that nonsense by simply flashing a smile to win over the Masters of Evil. 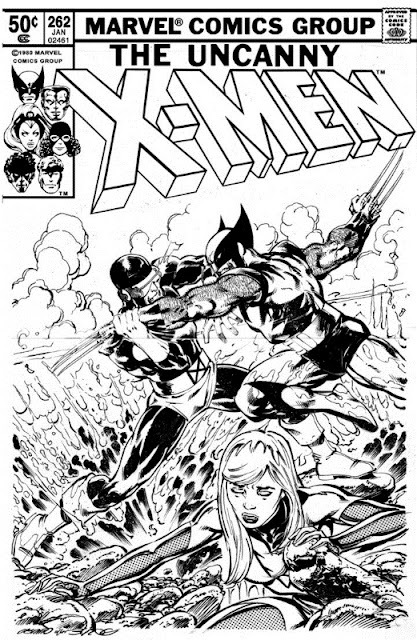 When next we saw Starfox, it would be during the John Byrne days on the book somewhere near the end of 1990. To Byrne's credit, he picked up on Starfox's chase of Nebula. Clearly my grandniece has wandered far in the time I searched for her trail between the stars"
You also clearly haven't changed your ways, you sly fox... Even after six years. But then, what is time to an Eternal? ROM’s long awaited return is finally here. 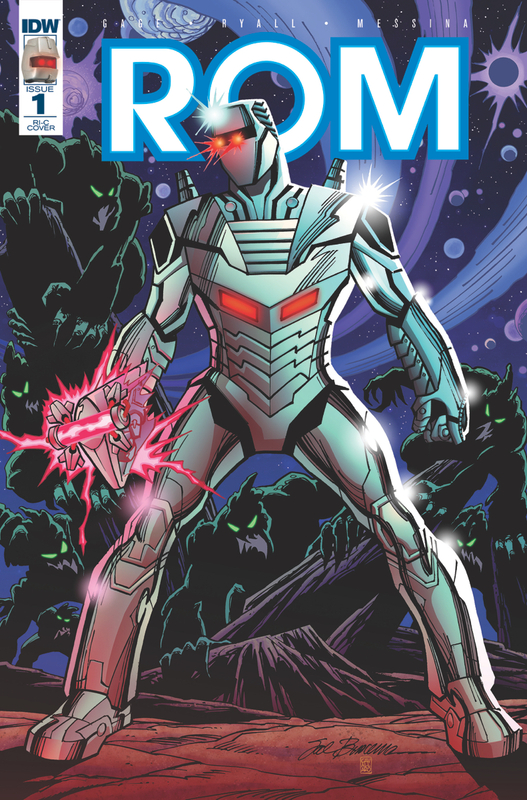 We got a brief glimpse of it in the ROM #0 FCBD edition, there’s nothing like holding a #1 in your hands! The story opens with a fun homage to ROM’s original crash landing back in 1979. 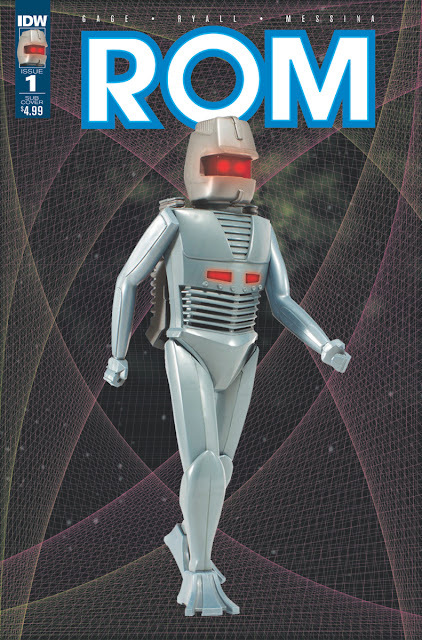 We get a good look at the functionality of ROM’s modern appearance and how his weapons and devices are now an extension of his armour. 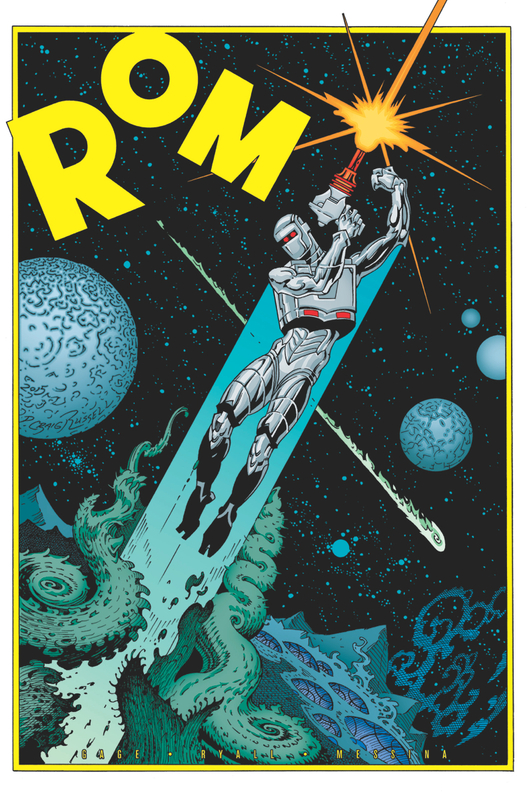 Just as ROM has received an upgrade, the Dire Wraiths’ get to level up as they’re able to use human lifeforce to shape change into monstrous hawk creatures. 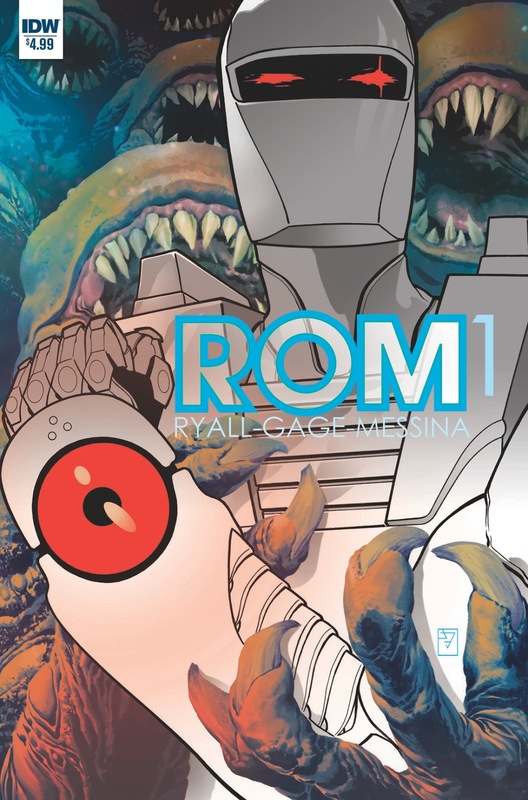 After an initial encounter with the Dire Wraiths, ROM has to figure out how he’s going to approach dealing with their infiltrated brethren. He comes to the rescue of a young woman suffering from post-war PTSD and unaware that the Dire Wraiths have killed her entire family and replaced them. After an impressive battle sequence, ROM tries to settle down the devastated young woman, Darby, who’s in a state of shock. Hats off to Chris Ryall and IDW Publishing for pursuing this character. 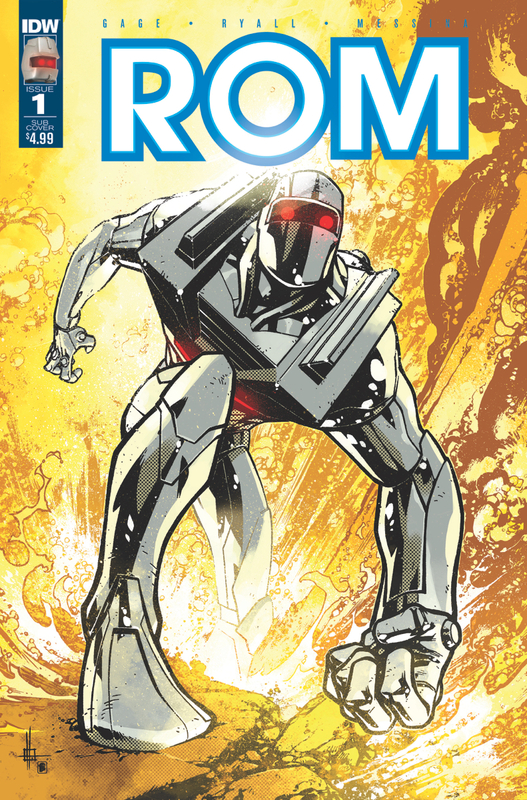 Re-imagined for a whole new generation, with minor alterations to his armor and a new supporting cast, ROM is ready to continue his epic battle against the Dire Wraiths who have infiltrated human society. Thankfully, his supporting cast has been modernized as well, with stronger female protagonists that will have more of an active presence. 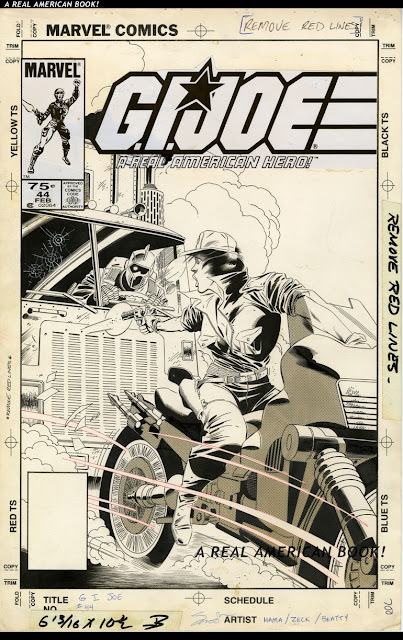 Messina’s art reminded me a lot of the work of Ian Akin & Brian Garvey from the 1980s. 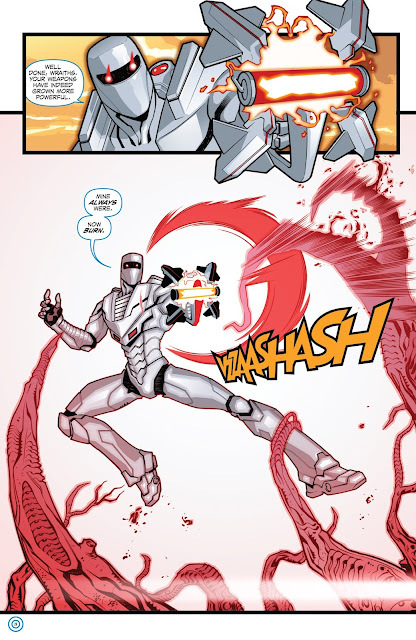 The panel layouts and the smooth flow and transition really brings the action to life. 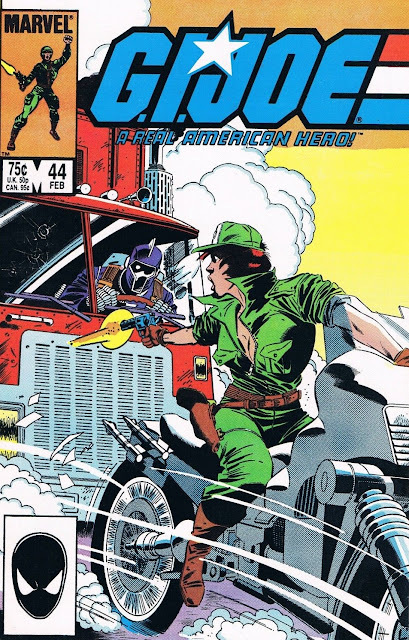 I really liked the tip of the hat to Bill Mantlo, the Marvel Comics writer who pretty much created the ROM-verse, in naming the park in the story, Mantlo Park. The only aspect that I wasn’t thrilled about was the upcoming crossover with the other IDW Hasbro properties. While my inner child is blow away at the thought of pitching his GI Joe action figures against ROM, the adult me has become wary of event driven storyline and was hoping for something a bit more focused and streamlined. 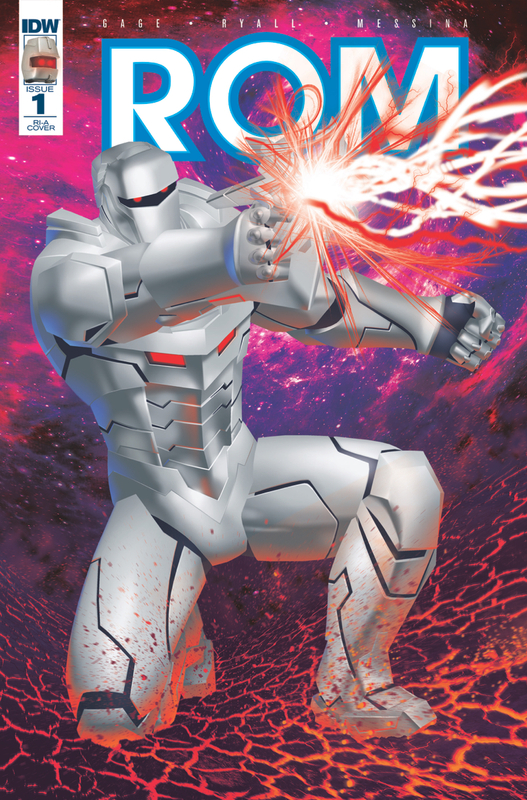 However, I’ll be there for the next issue to see where they take ROM, the Wraithslayer next! This first issue was worth the 30 year wait! 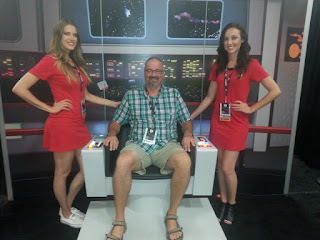 It’s hard to believe that it was a week ago today that we flew out to San Diego for SDCC. An emergency stop at a clinic for pink eye, horrible traffic getting to the airport, and a slow leak in a tire were the only issues plaguing us on our trip to the airport. The flight was on time and really felt cramped for the five hour flight. All our luggage arrived safely and we checked into the Sheraton Marina and head downtown on the free shuttle. That Yellow Line shuttle was amazing, allowing us to travel back and forth from the Convention in about 15 minutes. Getting our badges was very streamlined and quick. 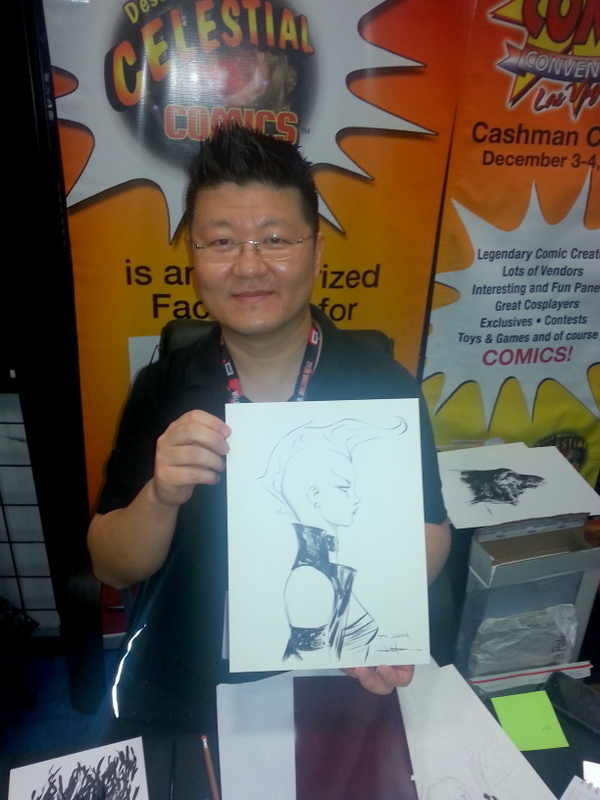 After a quick bite to eat, we got into the Con for Preview Night, but found out that Art Adams’ sketch list was already closed. Met the lovely and talented Marjorie Liu, writer for Image’s Monstress. After a couple of hours exploring with our jaws wide open, we headed back to the hotel and decompressed at Quinn’s, which served a lot great local craft beer. On Thursday, after a big breakfast at the hotel, we headed down for our first full day. 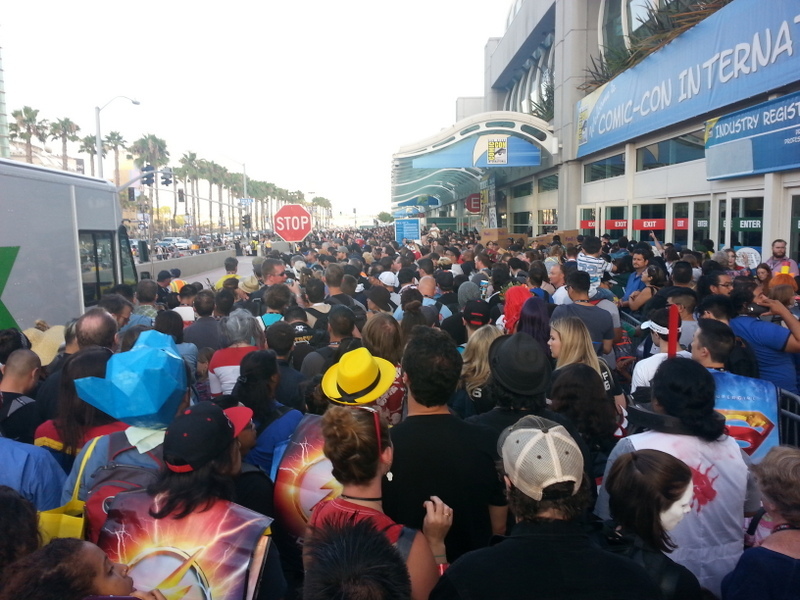 We got into the panel and signing ticket line, but quickly gave up after an hour wait and the line not going anywhere. 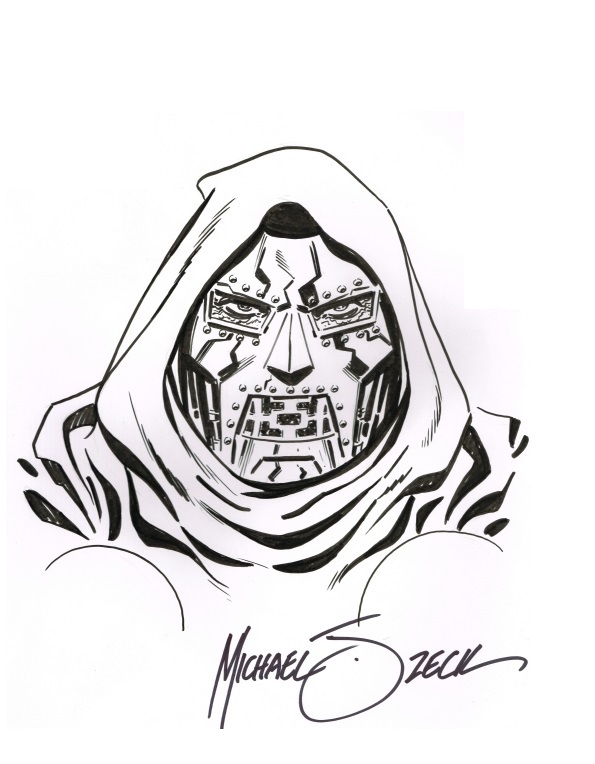 Snagged a great Shadow sketch from Howard Chaykin. Collected some autographs from Chuck Wendig, Mark Brooks, Len Wein, and William Gibson. Had a nice Italian dinner in the Gaslight district watching the cosplayers. Ended the evening on a rooftop patio with an amazing view of the city and had drinks next to Lucy Lawless and Ted Raimi. Friday was a rather quiet day as I did a bit of shopping and then made my way over to NerdHQ for the Con Man panel. 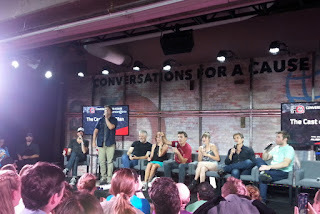 It was a great, intimate venue and the panel was a lot of fun. Got a few of my Master of Kung Fu issues signed by Paul Gulacy. We had a light dinner and enjoyed a bottle of the Star Trek Anniversary beer. We checked out the gaming area and played a few games of Shadows over Westminster where we chatted with the game’s designer. After a bit more cosplay watching along the Gaslight district, we called it a night. 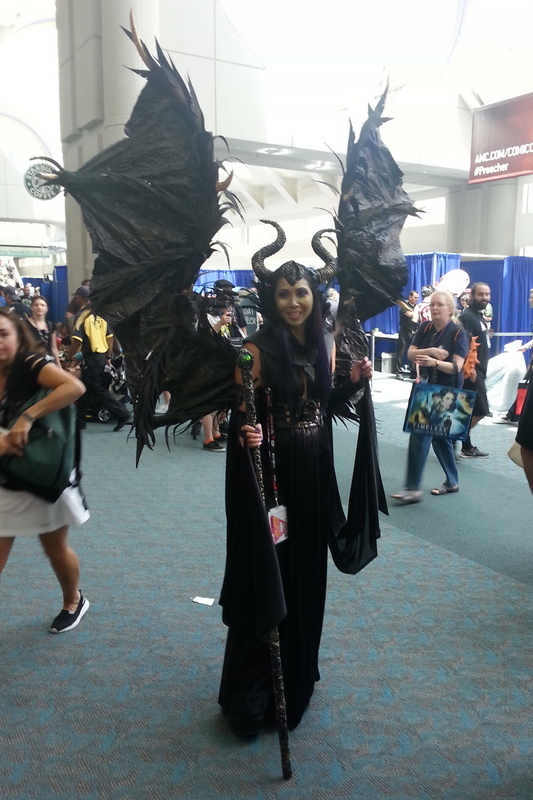 Saturday was crazy, so I knew that I could get to the Con a bit later. I met author Jonathan Maberry who had edited an anthology I was a part of. 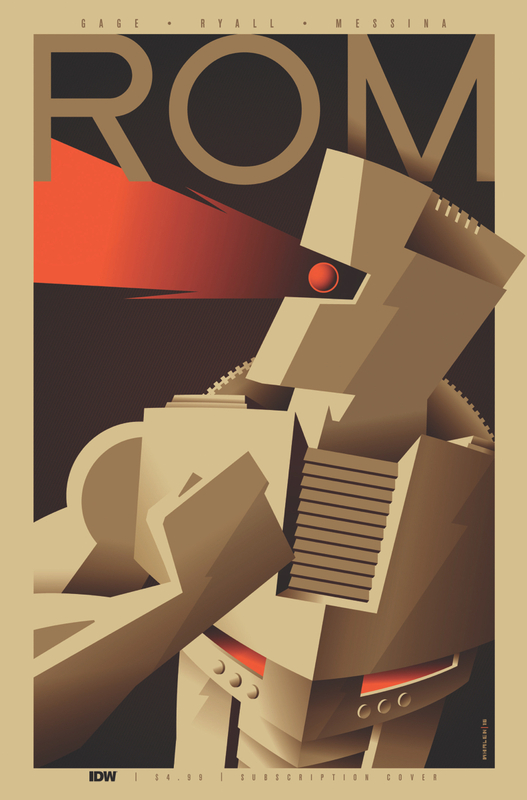 When he asked me what story I had written, I totally blanked and couldn’t remember the title of my story (which was Dirt Man, about a grave golem terrorizing a small town). Had a great lunch at Smash burger. Got my ROM #1 SDCC Exclusive edition signed by the creative team. The crowds near the end of the day were insane. It took us over 20 minutes just to go from our shuttle bus drop-off area to the Gaslight district. 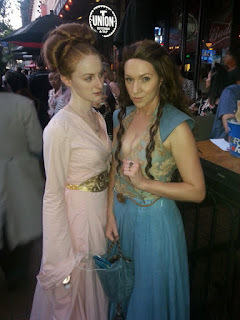 After dinner, we headed back to the rooftop bar, but were turned away as it was an NBC exclusive party. On Sunday, after carefully backing my books and loot, we hit the show for our last day. Did a bit more shopping picking up an Enterprise Hallmark ornament and a Shopkins exclusive toy for my daughter. I picked up my lovely Punk Storm sketch by the talented Jae Lee, who turned out to be a big fan of my blog. We had a last dinner at a Kansas BBQ joint where scenes from Top Gun were filmed. Exhausted, we picked up our luggage and flew out on the red eye. This was my third visit to SDCC and each of them is special in their own way. 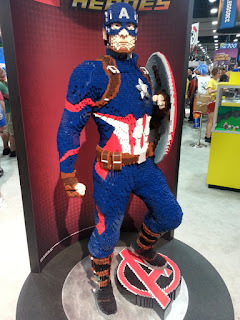 I travelled with 3 other guys who had never been, and part of the fun was simply watching their shock and awe as they experience the enormity of SDCC. The Fan Expo we enjoy in Toronto is nowhere near the scale of SDCC. 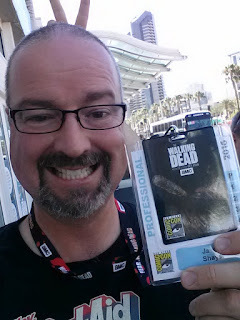 The venue and administration at SDCC is much better handled and has more of a professional feel to it. Also, San Diego genuinely embraces the Comic Con, with nearby hotel venues, theme restaurants, and an overwhelming amount of off-site activities. My only real complain was how all the lines for the signings were handled. Not a lot of the volunteers knew what was going on which spawned many different and confusing line-ups. 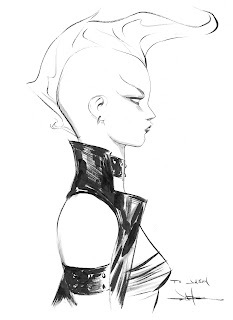 The highlights of the show to me were meeting the creative team of Monstress and that beautiful Punk Storm sketch by Jae Lee. 1985: The Eros Avenger part IV: Eternally Yours! Alpha Flight Omnibus in 2017!